Dart World has done it again! We have taken our killer combination of the number one selling dart, the 80% Tungsten Piranha, and the best selling shaft, the Top Spin, and enhanced it with Dart Worlds own NON SLIP RAZOR GRIP. The Razor Grip is comprised of hundreds of tiny cuts creating a unique gripping pattern allowing the player to have a confident finger placement on the barrel. The Piranha is available in Dart Worlds premium Ultra case, a rich jewelry style box covered by leather quality vinyl. The Piranhas are undergoing a drastic change. So- Until the line is Stabilized we must reserve the right to Substitute New-for-Old Model Numbers or Old-for-New. 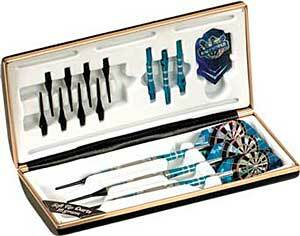 The Dart Sets themselves are the Same. Just Different Packaging. If you Want- you may declare in the 'comment' section that you want Only the chosen model number and will wait on it.